Immersing yourself in Instagram is much more than deciding which photo, video or story has garnered most impressions. Understanding how each type of content works, by tracking the key metrics, is actually vital for the development of any campaign on Instagram and other social networks. To grow your following, all you have to do is define and use the right metrics for Instagram. These will help you to understand the demographics of your followers, optimise your content and evaluate your overall performance. And that’s exactly how the brands exploiting this platform to the max are working. For example, imagine you have an online clothes store and need to share new season garments. You may have images of the product against a white background, a coloured background and another image with a model. From here on and after publishing these three images, the interaction data, for example likes, comments and clicks, will indicate which of the three is most successful. And that’s how you can steer your next posts towards that trend. Or, perhaps what attracts attention is the content about fashion trends rather than the product itself. Therefore, whatever sector you’re in, delving into metrics for Instagram will help you to find out more about your followers’ wishes, which will, in turn, help you to improve your content and boost sales. 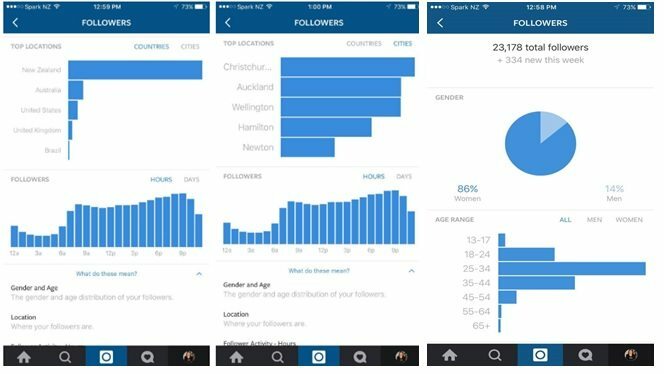 Would you like to know how to best analyse your Instagram strategy? Do you need to detect which metrics will provide you with the most useful information? Before investigating the performance of your content and really understanding what makes one type of content better than another, it’s important to start with the demographic data. That is to say: knowing where your followers live, their age, etc. Because the more engaged they are with your content, the more adjustments you’ll need to make. Each detail has an impact. However, if you’re scared of dealing with metrics for Instagram, you should know that luckily the app’s own metrics make discovering all this data a simple little job. You can even access it straight from the app itself. Having knowledge about this is no good if you don’t know who you are targeting on a daily basis. It can also help you to determine what type of content to publish and when. For example, if your audience is young, you might want to publish more regularly to align yourself with the frequency with which they use their phone. Or you might try using memes or content that refers to current trends instead of being strictly informative. The same goes for gender. If the majority of your followers are women, perhaps you should lean towards more personalised content, aimed at this market sector. As per the age and gender graphics, knowing the location of you audience may help you more than you think. Above all to improve your content plan. Imagine a large part of your audience is located in English-speaking cities or countries. But you also have people who speak in Spanish. You could consider adjusting your content strategy with copy in additional languages so it can be understood by all. Additionally, however, by having an awareness of the cities where your followers are based, you can ideally adjust to fit the time zones and thereby find the best time to publish content. However, if you want to determine this accurately, there are other metrics for Instagram that delve deeper into this. And why not share information that is relevant for the majority of those who live in certain places. So that your brand is a success on Instagram, you must know as much about your audience as possible. Just like in any digital marketing campaign. But in addition to information about your audience, this fashionable platform also provides information on what times are best. When the audience gets more involved. 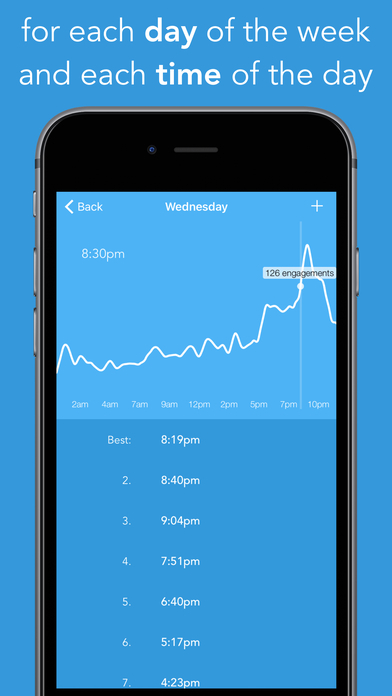 You can toggle results to see the most powerful days and times. And each of them will show you information about the participation and engagement generated among users. This data is especially useful for determining what time to publish at, and which day normally generates most engagement. You may find that the level of engagement is practically the same every working day, but it might increase during the weekend or vice-versa. Which is why there are various apps that can be more concise. These include Prime. With this type of information on the table, you can better manage your content plan. Ideally you keep the most powerful publications for key days at the perfect time. Do you know the difference between engagement, impressions and the other metrics-related terms for Instagram? 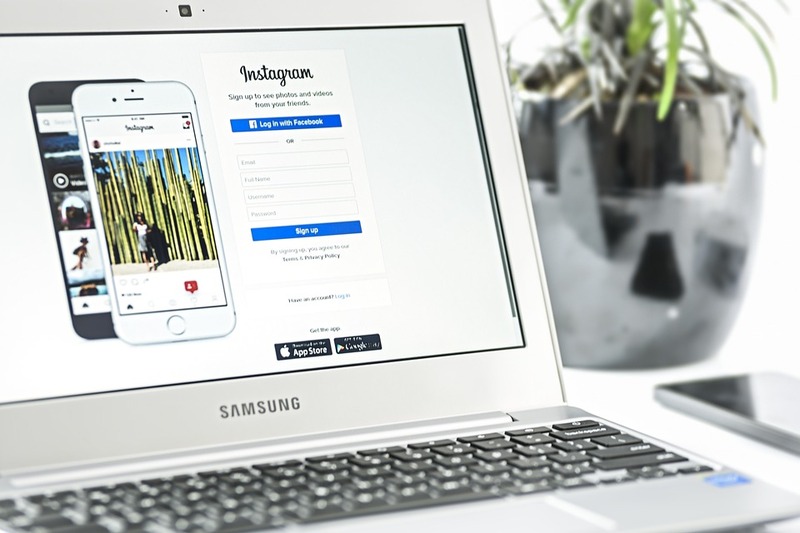 Now that you know how they can impact and guide metrics for Instagram in your strategies, it’s time to delve into each of them. Impressions, both on Instagram and any other platform, refer to the total number of times your photo, video or story has been seen. This number includes users that browse your feed and click on your company profile to see a photo or through Instagram Direct. Therefore, when it comes to consulting the data regarding the most successful days and times, impressions are one of the metrics you should take into account. Just like impressions, the reach shows the total number of visits. But instead of calculating the total number of times users have seen the publication, it restricts it to opinions of unique users. That is to say, it considers that the user only sees the content once. When a user, for whatever reason, views your photo 4 or 5 times, this would count as 4 or 5 impressions. But the reach would just be one user. Engagement is one of the metrics for Instagram that is calculated by taking into account the total number of unique accounts that have liked, commented and saved a particular photo or video. However, you must take into account that the metric will not count various comments by one single user. Therefore, when you launch draws or competitions with that dynamic, the engagement provided by the app will not be entirely concise. The rate of participation measures the percentage of followers who interact with your publications. Generally speaking, if you want to calculate your average engagement rate for Instagram, you’ll have to divide the number of likes and comments between the number of followers. 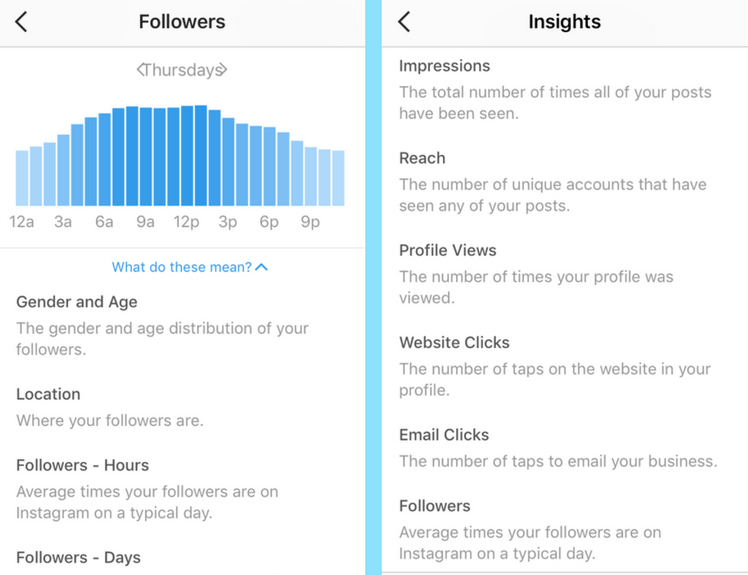 Likewise, there are various external tools like the Later app, which allow you to access these metrics for Instagram more clearly. The Instagram app itself provides you with information about the number of followers you gain each day. But where it fails is that it does not provide you with information about the total number of followers at certain periods of time. In this sense, the Later tool can be more specific and helpful to you. In the majority of cases, many metrics are calculated in the same way. Regardless of whether the content is an image, video or story. But this does not mean that the three offer the same experiences. The focus differs and this must be taken into account. While photos and videos appear on each individual user’s feed, the way the user interacts with each type of content is very different. And it clearly affects the end statistics. Think about it like this: As you scroll down your feed, you see photos and immediately decide which ones you like and don’t like. But videos require a bit more time. And this is exactly why videos get fewer likes than photographs. Therefore, an alternative for measuring your success is to look at the number of views instead of the number of likes. On Instagram, a view is counted from 3 seconds and its the same story for a 30 second video and a Boomerang. In comparison with videos and pictures, Instagram stories mean more active engagement by the users. For this reason, it’s important to know how to take advantage of this new tool to gain visibility and target new leads. Drop-offs. This is the number of times a user has left your story. This metric can be revealing and show which parts of your story you need to improve. Replies. As well as engagement with photos and videos, replies refer to the number of times a user sends a direct reply to your story. However, unlike the comments under a photo or video, these replies end up in your inbox and do not appear publicly. The way you determine which KPIs to choose depends on your objectives. In other words, if you’re seeking to create a community, you should look at engagement. But you’ll have to focus on the number of followers, if you want to gain followers. And, to do so, collaborations with influencers are never a bad idea. Are you interested in developing campaigns with fashion influencers? If you want to work on an influencers campaign in Spain or Latin America, Coobis gives you an efficient solution. It provides a service with over 9,000 specialist media across all sectors. This content marketing platform uses services that let you amplify your message whereby influencers registered on Coobis repeat the content of your campaign.